Hi guys, if you are using the wlIP (weatherlink) plugin to update your database then your station data is currently not being saved to the database. 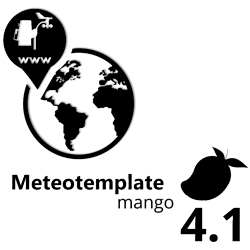 Davis made some changes yesterday evening to their XML feed and the result is that the XML feed is not a proper XML and therefore is not parsed by … Read moreWeatherLink Users – Important! New plugins, blocks and important updates for all users! Hi guys, this is very important and affects all. There have been some changes made in the Google Maps API last weekend, which made several plugins and pages of the template either completely non-functional or malfunctioning. I have therefore prepared updates to these plugins and also a bug fixes file for the template, which will … Read moreNew plugins, blocks and important updates for all users! Hi and sorry for spamming, I already discovered a few minor problems with the homepage and also added a few new features that some of you have already suggested. However, I have discovered one major “bug”, that you should definitely fix as soon as possible. Basically I was wondering why the page was loading so … Read moreHOMEPAGE – BUG FIX!